BEAUTIFULLY UPDATED VILLA that is TRULY MOVE-IN READY! MAINTENANCE FREE, PRIVATE CONSERVATION VIEWS, GREAT ROOM FLOOR PLAN with LARGE DEN/OFFICE or 3rd BEDROOM, VAULTED CEILINGS plus 2-CAR GARAGE make this a great find. Soothing Neutral Tones throughout accent HARDWOOD and TILE Floors. Great Room features Wood Burning BRICK FIREPLACE with Custom Made Hickory Mantle and Lots of Light. Enjoy the fantastic SUN ROOM ALL YEAR ROUND approximately 260 EXTRA SQ. FT. not included in stated sq. footage complete with NEW DOUBLE PANED WINDOWS in 2017 ($10,000) and WET BAR with GORGEOUS WOOD CABINETRY and GRANITE COUNERTOP. UPDATED KITCHEN boasts LIGHT, SHAKER STYLE CABINETRY, TILE BACKSPLASH, and NEW GE STAINLESS STEEL FRIDGE, FRIDGIDAIRE DISHWASHER and RANGE in 2018. Prepare to feel pampered in the COMPLETELY RENOVATED and LUXURIOUS MASTER BATH with DOUBLE VANTIES, WOOD CABINETRY, MARBLE COUNTERTOP and TILE AND SPACIOUS WALK-IN SHOWER with BODY SPRAYS. All this plus access to a SPARKLING COMMUNITY POOL and community Tennis Courts, Basketball and Playground. 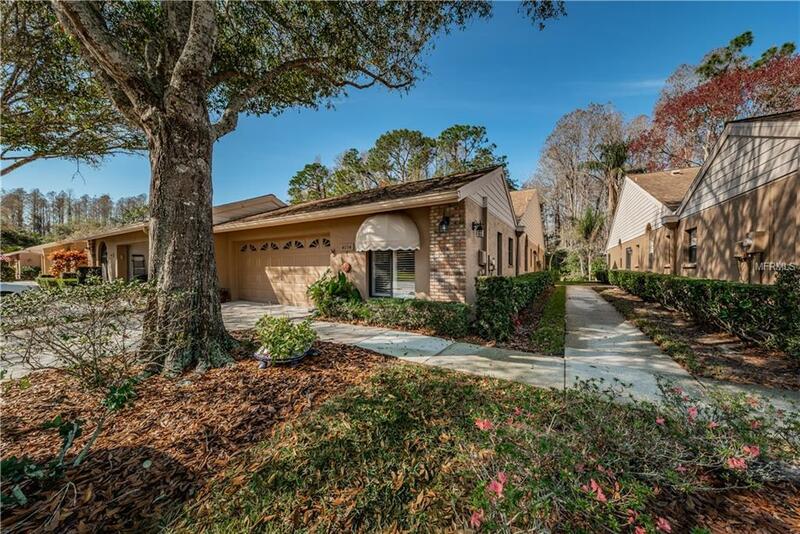 Convenient to Tampa International Airport, Award-Winning Beaches, John Chestnut Park, Pinellas Trail, Restaurants and more. Additional Lease Restrictions Maximum Of 5% Of Units Can Be Leased. See Hoa Documents For Regulations. Additional Lease Restrictions Maximum Of 5% Of Units Can Be Leased. See Hoa Documents For Regulations. Additional Parcels Yn No Association Amenities Basketball CourtPool Association Approval Required Yn Yes Association Fee 408.00 Association Fee Frequency Monthly Association Fee Includes Community PoolEscrow Reserves FundPool Maintenance Association Fee Requirement Required Association Yn Yes Available For Lease Yn Yes Cdd Yn No Community Features Deed RestrictionsGated CommunityPlaygroundPoolTennis Courts Disclosures Hoa/Pud/Condo DisclosureSeller Property Disclosure DPR Yes Flood Zone Code A Garage Yn Yes Homestead Yn Yes Listing Terms CashConventional Max Pet Weight 25 Minimum Lease 1-2 Years Monthly Hoa Amount 408.00 New Construction Yn No Num Of Own Years Prior To Lse 1 Pet Restrictions 1 Dog Or 2 Cats Pet Size Small (16-35 Lbs.) Pets Allowed Number Limit Property Condition Completed Property Description End Unit Property Sub Type Villa Realtor Info SignSold As-Is Security Features Gated Community Senior Community Yn No Special Listing Conditions None Tax Annual Amount 1969 Tax Year 2017 Utilities Cable ConnectedSewer Connected Yrs Of Owner Prior To Leasing Re Yes Zoning Rpd-2.5_1.